An Introduction to the Devout Life is a book to be read with pencil in hand. It is a book to be read again and again. It is a book to make your guide for the rest of your life. It goes to the heart of becoming good. Its aim is to help you be rid of sin and even the inclinations to sin. Alone, its 10 brief meditations in Part I will orient you toward God for the rest of your life. No one will come away without being profoundly impressed and without being motivated to enter upon the devout life . . . which leads ultimately to God and to Heaven. This is the original TAN edition now with updated typesetting, fresh new cover, new size and quality binding, and the same trusted content. 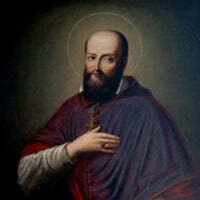 St. Francis de Sales is a doctor of the Roman Catholic Church, who was active in the struggle against Calvinism and co-founded the order of Visitation Nuns. He is known also for his writings on the topic of spiritual direction and spiritual formation, particularly the Introduction to the Devout Life and the Treatise on the Love of God. In addition to his spiritual works, his writings include controversies against Calvinists, letters, sermons, and documents on diocesan administration. St. Francis de Sales provides a wonderful guide for all newcomers to the spiritual life. His use of metaphor to explain concepts is top tier. I highly enjoyed the book and intend to refer back to it in the future. I have not read this from cover to cover. However, this was my main spiritual reading for about a year. What I would do is look in the index and go to chapters that dealt with whatever I was going through. His counsel on dealing with anxiety I remember to have been especially good. So, in short, even if you don't want to read it all, this is a great one to keep on your shelf. You never know when you might need sound advice on a specific topic.